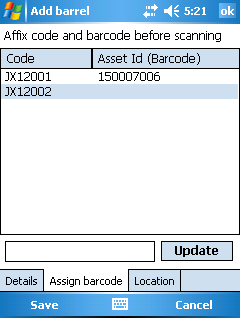 If you’re bringing in a number of barrels with the same properties you can add them all in one go on the legacy barcode scanner. 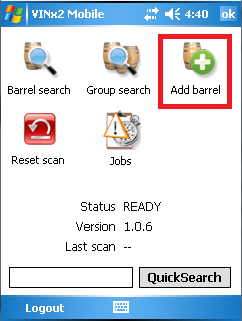 The system will generate the next barrel code for you and then you assign a barcode to the barrel by scanning it. With the vintrace Mobile application running on the scanner, tap the Add barrel icon. 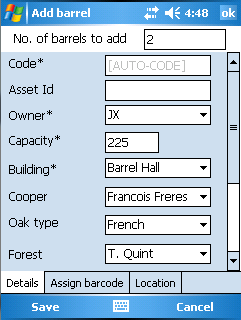 Enter in the number of barrels you're adding, and the properties. Tap Save which will create the new codes, and take you the barcode assignment. Affix the barcode label to the barrel and scan it to assign the right code. 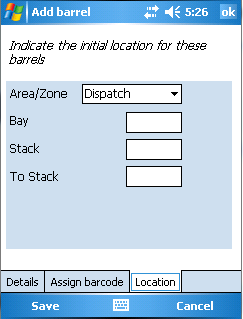 You can also update the location of the barrels in the Location tab. When completed tap Save to confirm.